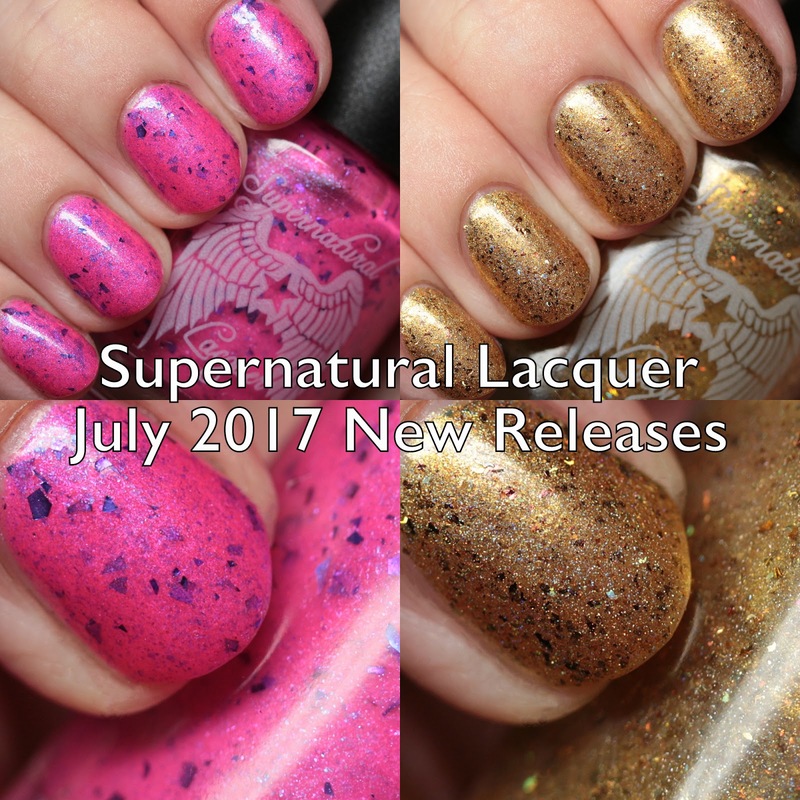 Supernatural Lacquer is releasing two gorgeous new polishes on Friday, July 21 at 9PM EST. These include an amazing pink neon that helps raise money for Cuddles for Clefts and the July monthly polish. Let's check them out! Supernatural Lacquer A Thousand Words is a neon pink with duochrome blue-to-magenta microflake shimmer and large indigo metallic flakes. It covers in two or three thin coats and dries quickly. The blue flakes are thinner than the shred glitters of yore, and while they have some texture, the can be smoothed fairly easily with top coat and are not extremely difficult to remove. The price of this polish will be $12 plus shipping and $5 from every purchase will go to Cuddles for Clefts, which provides care packages and support for children undergoing cleft palate surgery. This polish will be available from July 21 at 9PM EST to July 23 at 9PM EST. 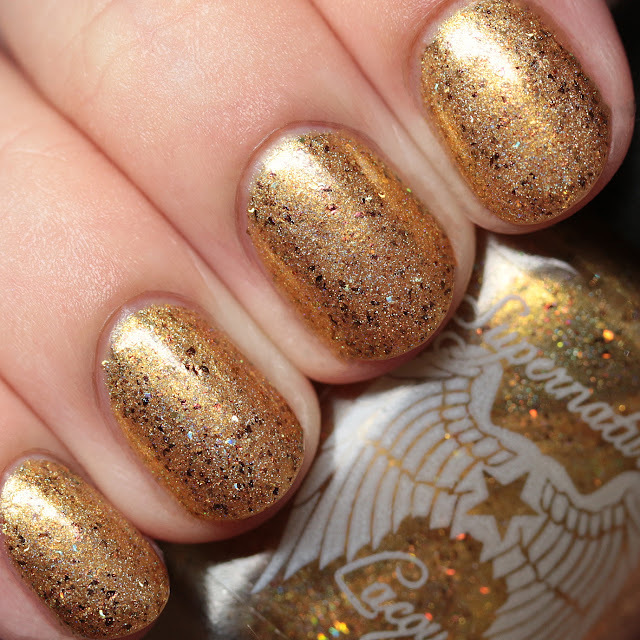 Supernatural Lacquer Lasso of Truth is a gold metallic shimmer with red/orange multichrome flakes, scattered holo shimmer, and holo shred glitter. 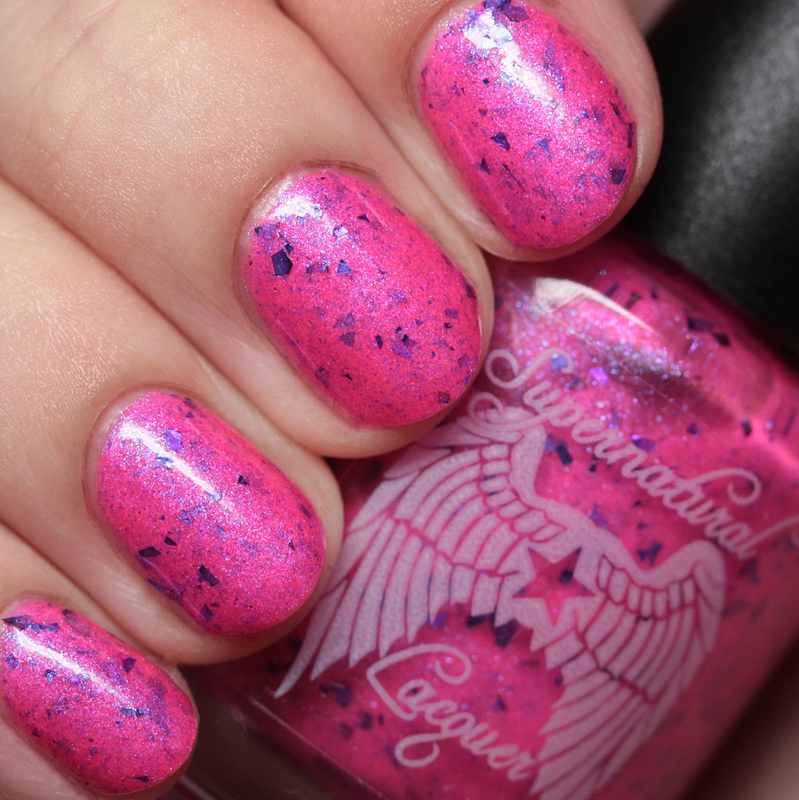 This has a fantastic formula that is surprisingly smooth with a single layer of top coat. It is not difficult to remove and has so much flash! I wore it in three thin coats, but two are enough. These polishes are available on July 21 at 9PM EDT, along with restocks of The Mythical Egg Trio, Cosmic Peacock, the Birthday Box, and two Facebook group customs, The Road So Far and Crossroad Blues, and prototypes (one per person). Are you planning to be there?